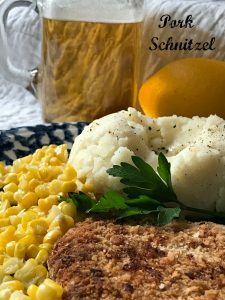 German Schnitzel recipe is a perfect addition to your German recipe collection. 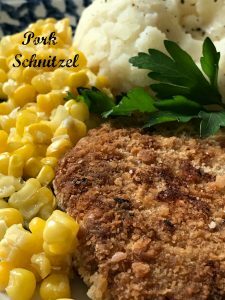 Schnitzel are really just thin cutlets and can be made from veal, pork, chicken or turkey. The cutlets are pounded until thin with a meat hammer (this will also tenderize the meat) the cutlets are then breaded and fried. It doesn’t get much easier than that, now does it. 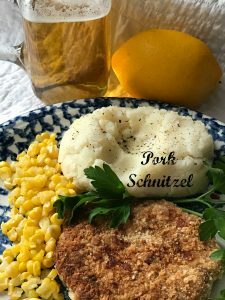 One of the most traditional recipes for schnitzel is for Jäger-Schnitzel or Hunter’s Schnitzel, which is served with a fantastic mushroom sauce or gravy. This sauce is made with fresh mushrooms, sour cream butter and pan drippings. 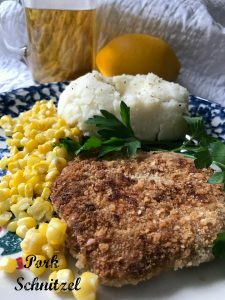 Since this was my first attempt at making schnitzel, I wanted to try it with just the lemon wedges, the juice is squeezed over the cutlets before eating, this is the most traditional way of serving schnitzel. After attending the Old World Christmas Market in Elkhart Lake WI, I’ve had German schnitzel on my mind. At the market my son and I always order a pulled pork sandwich on a pretzel roll with Dusseldorf mustard. I also order a slice of apple strudel. This year my DIL ordered German potato pancakes served with applesauce. They serve German schnitzel at the Christmas market too. Since then I’ve had both on my mind and have wanted to make both. Today’s the day to share German Pork Schnitzel, so turn on some polka music, pour a mug of Bavarian or Dark German Beer and make it German night at your house tonight. 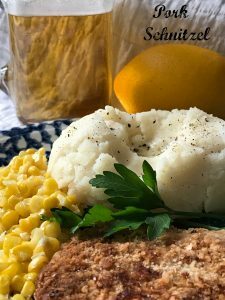 German Schnitzel is a fast, easy and affordable. The perfect dish to serve on those busy weekday nights. 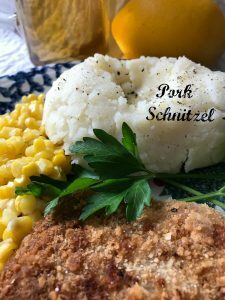 Schnitzel can be ready in under an hour and if you serve German schnitzel with (boxed) creamy mashed potatoes and a side of buttered corn, you’ll have a delicious meal on the table in no time. Plus, you’ll have a meal your whole family will love.